Last month we released a number of updates to version 5.10, which included the ability to schedule email blasts. Next month we have a number of new features planned for release, which I will share more details about in the next newsletter (you can always take a sneak peek at our feature progress on our WishList Forum). How our move to Amazon Web Services (AWS) will make Wild Apricot faster and more reliable. We know you count on your Wild Apricot site to be fast and reliable. Some time ago, we realized our current hosting provider wasn’t delivering the service level our clients needed, and so we started exploring alternatives. So, in June of this year, we’ll be switching to Amazon Web Services (AWS). We chose AWS based on their worldwide reputation for being the fastest and most reliable cloud platform available. This will be a big leap forward for Wild Apricot in terms of system stability and performance. Once our move to AWS is complete, you should notice an improvement in the speed and reliability of your Wild Apricot site. As we get closer to the AWS migration, we’ll provide more information about the move. If you use Wild Apricot to send commercial or promotional emails to Canadian residents, then you need to comply with the Canadian Anti-Spam Law (CASL) and have express consent from all your Canadian contacts. CASL went into effect on 1 July 2014, and applies to any organization that sends commercial electronic messages to recipients based in Canada. Penalties for non-compliance come into force on July 1, 2017. The maximum penalty for violations is $1 million for individuals and $10 million for businesses. To help you obtain express consent to send emails to your Canadian contacts, Wild Apricot is adding an opt-in mechanism as part of the 5.11 release, which is currently scheduled for mid-May 2017. Once it launches, it will allow you to send consent request emails to your contacts and then track the opt-in status of each contact in the Email settings and log tab. Below is a screenshot of how it will look. Enabling the opt-in mechanism will also add a consent checkbox to all forms on which a new contact is asked for their email address. Below is a screenshot of how this will look. For more information on CASL and what it means to Wild Apricot sites, click here. For information on Wild Apricot’s opt-in mechanism, keep an eye out for upcoming 5.11 release announcements. This month we released a colourful, new responsive website theme: Kaleidoscope. Using content gadgets as building blocks, the Kaleidoscope theme set delivers a flat, modern look. This theme applies different theme colors to section headings and gadget backgrounds, highlighting different elements and drawing attention to important calls to action. As a general purpose theme, Kaleidoscope provides an excellent starting point for designers and others who want to quickly build a modern-looking site. Among the theme-specific functionality available with Kaleidoscope is a new headline gadget designed to display titles and headings for sections or other gadgets. 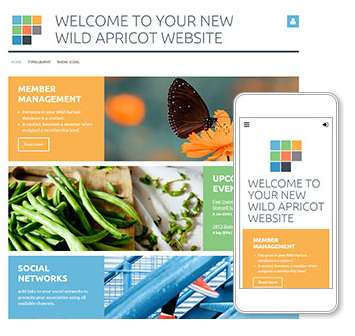 Wild Apricot has dropped support for six older website themes. This will allow us to focus our development and testing efforts on newer, more responsive themes. If you are currently using one of these themes, your site will continue to function as before, although new gadgets – or new features for existing gadgets – may not work as expected with these themes. You do not have to switch your website theme unless you want to take advantage of new functionality in the future. These themes are outdated and the source of a number of bugs. Few clients are switching to them, and many are switching away from them. Basically, they are not worth the effort of updating and maintaining. Instead, we will continue to release new, modern-looking website themes, and continue supporting our many other fully responsive themes. What do we mean by not supporting? How do I know which theme I’m using? To check which theme you are currently using, hover over the Website menu in admin view and click the Theme option. The theme you are using will be displayed beside the text, "Your current theme". For instructions on switching themes, click here. Sign up now and we'll see you on May 9 at 2:00 PM (ET) / 11:00 AM (PT). Love free webinars? We’ve compiled a great list of beginner nonprofit webinars on a variety of topics (like marketing, finance, and events) in one of this month’s blog posts. We also published posts on other great topics like how to find a speaker for your events, and how small nonprofits are generating thousands with peer-to-peer fundraising. On the Canadian anti-spam law. I did a search of our Contacts list and we have no emails ending in ".ca". So I'm assuming we have no current Canadian contacts, which is not surprising. But if a Canadian person asks to join our club or our Mailing list, will there be an automatic request sent out to them to waive their anti-spam rights with us? No, an automatic request will not be sent to Canadian residents asking them to waive their anti-spam rights. The anti-spam provisions of CASL are enforced by the Government of Canada and cannot be waived by individuals. Secondly, there is no way for Wild Apricot to detect whether an applicant is Canadian or not. Canadians are free to sign up with email providers whose domain names do not end with .ca (e.g. hotmail.com). One thing you can do is add a country field, then use that field to track the country in which your contacts live. I hope this helps.